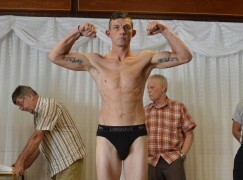 Liam Williams (15-0-1, 10KO) knocked out bitter rival Gary Corcoran in the 11th round of an exciting bad tempered affair. ‘The Machine’ was making the first defence of his British title and gained valuable experience as a headline attraction in front of a near sellout crowd at the Ice Arena Wales in Cardiff Bay. Emotions ran high in what was also a second defence of Williams’ Commonwealth strap. Frank Warren was so impressed that he plans to bring BoxNation cameras back to Wales on 17 September. 25-year-old Corcoran is known for an unrelenting attack and nicknamed ‘Hellraiser’ but he changed tactics, instead opting to circle the ring to start. Williams did make an initial mistake of overreaching and received a graze on the bridge of his nose in return. 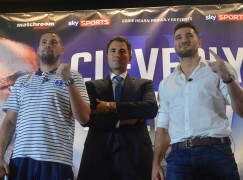 The pair clashed at a fiery press conference six weeks ago and that bad feeling transferred in to the fight. Shortly after a warning to behave in the first round, Williams uncorked a huge right hand that sent Corcoran reeling to the ropes. Despite the second bottom rope holding Corcoran up by the neck, referee Terry O’Connor incorrectly ruled that it was not a knockdown and the bell soon saved the visitor. When it did sound, the pair again engaged in an angry shouting match, echoing the electric atmosphere from the fans. Sadly, some fans got carried away and it resulted large-scale disturbances in the crowd. It saw the South Wales Police intervene and the arena’s full lights switched on during the third round. The third round was a bloody one in the ring as both suffered cuts over their eyes as a result of accidental head clashes. Another skull clash in the fourth opened up a more severe cut over Corcoran’s left eye, which survived an inspection from the ringside doctor. One of Corcoran’s key attributes is his mauling style but it drew a stern warning from the referee in the fourth round. The hitting and holding made the action scrappy and Corcoran pleaded innocence despite some very obvious fouls. Picked off by the jab of 24-year-old Williams, Corcoran struggled for clean connections when he ventured on to the offensive but he did present a constant moving target in the first half of the fight. It was something that Williams had to time and he did so with more and more success by the sixth, though he was limited to short attacks as Corcoran crudely smothered up close. “This is our half of the fight, Gal” was the call from brilliant cornerman Frank Greaves and Corcoran did manage another messy clinch that saw Williams come out with another cut. The count cut was difficult to keep track of as Williams bled from several scratches around his eyes. Corcoran’s punch volume dipped in the seventh and eighth rounds. Instead, he replaced it with lengthier clinches, often pushing down Williams’ body to his waist before rabbit punching. The referee lost patience for the fouls in the eighth and deducted a point for holding Williams and hitting him low on the blind side. It had been a long time coming and forced Corcoran to edge forward, walking in to a big left hook at the end of the session to wobble the visitor. Williams has never been past eight rounds and appeared to start pacing himself, picking his moments and he started to measure Corcoran’s approach in the ninth with flush single counters. Corcoran again broke the rules by hitting Williams after the bell to end the ninth round. When the 10th commenced, Williams attempted to control the range with his sharper straight shots and it was his turn to bend the rules on the bell, placing the top of his head in Corcoran’s face. There was a lot of focus placed on the fact that Corcoran had been the 10 round distance on three previous occasions and Williams was yet to pass eight rounds. However, the 11th round was new territory for both men. Questions were also asked, and answered, about whether Williams would carry his power in to the later rounds. The finish came as Williams found the room to catch Corcoran coming in with a flush right hand. It completely disorientated the challenger, who didn’t have the strength to hold on and he tiredly sloped to the floor. A frantic follow up attack ensued and Corcoran again stumbled downwards, which could’ve been called a knockdown. Still being hunted, Corcoran was in full survival mode but still found the time to rub Williams’ cuts with open glove to sum up a large part of his foul-infested challenge. It couldn’t hold Williams off though and the referee halted proceedings as the corner was about to throw in the towel. Corcoran’s trainer Peter Stanley suggested he had a rivalry with Williams’ guiding light Gary Lockett, who instantly dismissed the subplot. They had been in opposite corners when Ovill McKenzie was knocked out by Enzo Maccarinelli in round 11 of their 2013 rematch – the same round Corcoran was knocked out by Williams. Every round was closely contested and Williams edged most of them with his better quality. Still, he conceded that he felt it was his worst career performance as Corcoran succeeded in making matters scrappy. It was Williams’ first appearance in Wales since beating Darren Codona on the undercard of Nathan Cleverly vs Sergey Kovalev in 2013. The 24-year-old has come a long way since and established himself as one of Welsh boxing’s biggest attractions. Having personally sold over 1,100 tickets and headlining a Frank Warren show, it was by far the biggest occasion of Williams’ five-year career and he thrived on it as the crowd chanted ‘Dully’ – his hereditary nickname – on repeat throughout the fight. Williams was guilty of getting carried away and valuable lessons will have been learnt. Williams feared that his career could be over following a failed operation on a hand injury in 2014 and advise to retire in 2015. ‘The Machine’ rebooted though and collected the British title by taking just two rounds to ice the usually tough Scotsman Kris Carslaw in December. 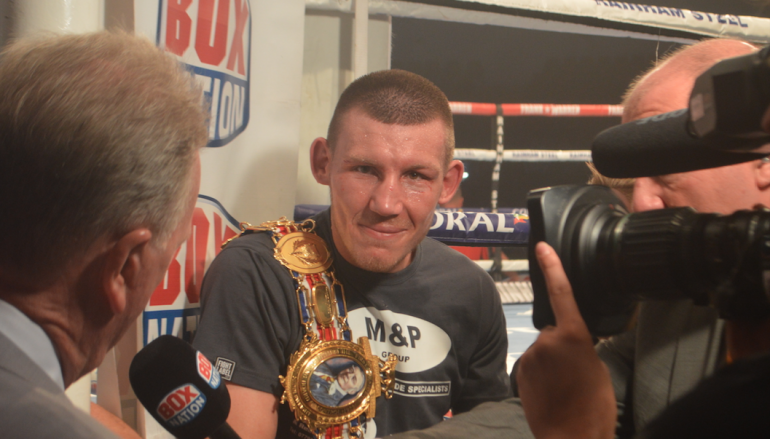 Corcoran came to Cardiff as the WBO Inter-Continental champion and he was ranked fifth by the governing body, whose champion is promotional stablemate Liam Smith. The bauble couldn’t be on the line, though as the British Boxing Board of Control [BBBoC] wouldn’t sanction it alongside the British title.